The recently passed Bill C-24 that intends to curb abuse of Canadian citizenship seems benign, level-headed, indeed from afar it might even seem thoughtful. But this recent piece of legislation is actually a very sinister trespass on both the quantifiable rights of Canadian citizens and the ideas which buttress them. A casual reading of the bill gives a rather lukewarm impression, with a longer stay requirement to obtain permanent resident status and mandatory letters of intent to be written by aspiring citizens. Perhaps these are positive aspects. At a minimum the law fulfills the Conservative Party’s, and more precisely the Minister for Citizenship and Immigration Chris Alexander’s desire to cut costs in our immigration bureaucracy. But that’s not the scary bit. 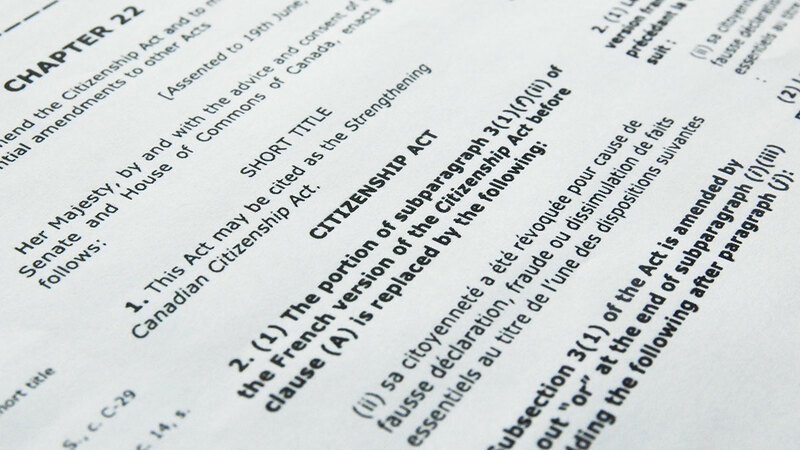 What frightens me as a dual-citizen, and what should frighten all Canadians, is a part of the text which establishes a second-class of Canadian citizens. Those among us who hold citizenship or are eligible to do so in another country are susceptible to the loss of our Canadian citizenship if any of the following are the case: have obtained citizenship by false representation or fraud, served as a member of an armed force or organized armed group engaged in an armed conflict with Canada, have been convicted of treason, high treason, spying offences and sentenced to imprisonment for life, have been convicted of a terrorism offence or an equivalent foreign terrorism conviction and sentenced to five years of imprisonment or more. The question begs to be asked. Does that sound like me? No, I daresay it does not. That’s hardly the point. The issue is that elected officials, bureaucrats even, and not judges will now have the power to revoke citizenship, something that should be permanent once obtained. That also means that there will be no due process for a certain segment of the population in these instances. To be sure, the actual scenarios where this aspect of the law would be used are exceedingly rare. Still, it is the principle that matters, and in this case the principle is that of one singular type of Canadian citizenship and the idea that all of us are free and equal before the law, every part of the law, no matter how obscurantist or trivial the clause. Why should I be treated even theoretically differently because I hold American citizenship via my mother? Why is my stature before the law not identical to that of my uniquely Canadian compatriots? Of course the law wasn’t conceived of with my case trotting around the frontal lobes of the Conservative Party’s policy gurus. No, the law is a cynical, contrived bit of legislation which underhandedly questions the loyalty of immigrants holding dual-citizenship. Chris Alexander asserts that citizenship is privilege and not a right, a dangerous thought which only functions to sustain anti-immigrant sentiment. The idea is that having a fast-track system wherein a bureaucrat can quickly and efficiently strip a criminally delinquent immigrant of his or her Canadian citizenship would in turn lessen the strain on the courts. But this reduces the processes of abolishing a Canadian citizenship, something I think we should all take rather seriously, to a formality. If that bit doesn’t unsettle the average single passport-holding, Charter of Rights and Freedoms-loving citizen, then what would?